2018 marked a particularly special anniversary for TruexCullins, as the firm celebrated 50 years in business. 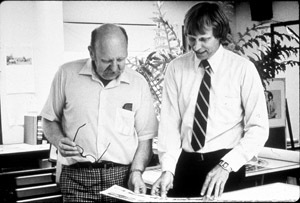 In 1968, William Truex Jr joined Eugene Alexander and formed a new architecture firm in the small city of Burlington, Vermont. From the very beginning, the firm’s civic role established a clear focus on urban planning and the design of buildings that serve a public purpose. 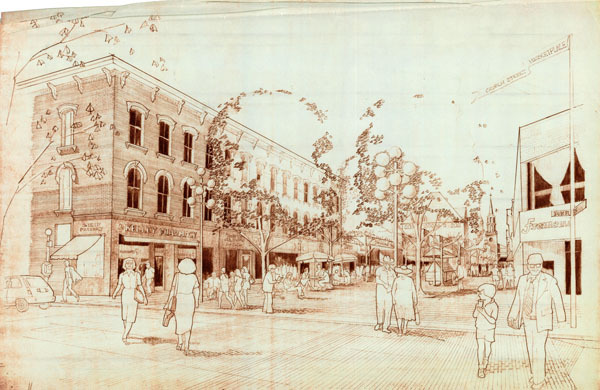 The new firm made an indelible mark on their hometown when, in the early 1970s, Bill Truex developed the first design concept for the Church Street Marketplace. Inspired by the pedestrian plazas of Europe, Bill joined a small group of Burlington’s civic leaders and initiated a pilot project, closing a busy downtown street to traffic to test the feasibility of a new pedestrian core for Burlington’s downtown. The project was a success and led to the active planning and design of the pedestrian marketplace over the following decade. Bill’s leadership resulted in the permanent removal of vehicle traffic from Church Street and its conversion into the award-winning Church Street Marketplace. The project involved an unprecedented closing of a major vehicular artery to create pedestrian linkages throughout the downtown area. Collectively, these and other urban improvement decisively enhanced the quality of Burlington’s downtown, contributing to the city center’s lively character and commercial vitality. Many North American communities have recognized the success of this project as a model worthy of replication. In 1997, the National Trust for Historic Preservation granted its Great American Main Street Award to the Church Street Marketplace, and in 2008, the Marketplace was honored by the American Planning Association as one of the 10 Great Public Spaces in America. In 1975, architects Willem deGroot and Tom Cullins started their own firm after having worked together at Burlington Associates, Architects and Planners. 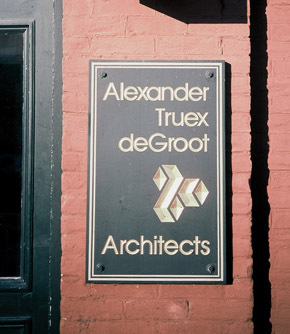 Two years later, they merged with Eugene and Bill to form Alexander & Truex / DeGroot Cullins. Rolf Kielman, who remains with the firm today, joined the team the following year in 1978. 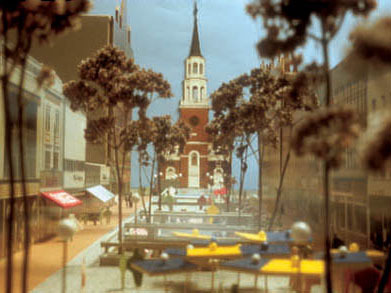 Eugene and Bill had started the firm by reinforcing the public realm through urban planning. In the 1970s and 80s, this focus grew to include a more diverse array of public and private projects, many of national significance. The firm expanded on their involvement in the development of downtown Burlington and surrounding communities, demonstrating the importance of place-making through thoughtful people-centric design, with a conscious blending of the interior and exterior. 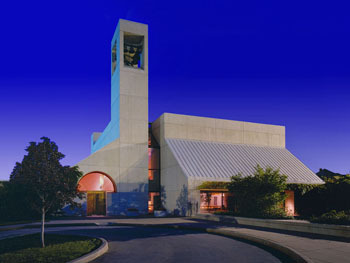 One of the most celebrated structures in downtown Burlington to this day is Saint Paul’s Cathedral, designed by Tom Cullins with Bill Henderson while at Burlington Associates in the early 1970s. The design of Saint Paul’s Cathedral was the winning entry in a national architectural competition. The Cathedral sits on a bluff overlooking Lake Champlain and is a kind of spiritual lighthouse that marks the city’s urban and natural edges. The sanctuary walls and cloister form the urban edge, the entry to this religious monument presenting itself responsibly to the street front. Alexander-Truex-deGroot became well known nationally for the development of regional blood centers. Starting with the Vermont/New Hampshire Red Cross Blood Center in 1974, the firm went on to design blood centers in eight other states, including the highly praised Richmond Metropolitan Blood Center and the Greater Hartford Chapter American Red Cross Blood Center, recipient of an AIA VT award for Excellence in Architecture Design. All of this work was driven by Bill Truex’s passion to create open, inviting structures that celebrate the donor. 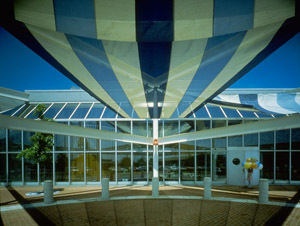 Other projects during this period include McAuliffe’s Office Products Center, winner of a National Design Award in 1973 and an example of creativity and innovation in an urban setting; and the Southwick Music Building at the University of Vermont, which contrasts the modern with early 20th-century revival, achieving a flattering effect not through imitation but through juxtaposition. The building engages its users with a play on shadow and light. The collective work by the firm in these early years advanced the notion that public architecture and planning can be accomplished with sustained commitment and creativity, and it reinforced the core belief that architects must be of service to their community. 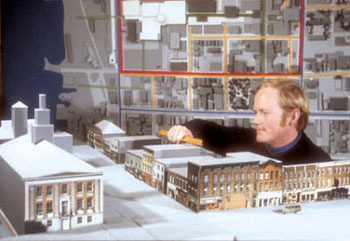 In 1982 the firm moved to its current location on Battery Street in downtown Burlington. While Tom Cullins served as Chief Architect for IDEA Center in Athens, Greece, the remaining partners merged into Alexander Truex deGroot Architects in the Battery Street location. Upon Tom’s return, and with the retirement of Gene Alexander, the firm changed names once again to Truex deGroot Cullins. The leadership team was soon joined by Steve Selin, Samir Elabd and Rolf Kielman. 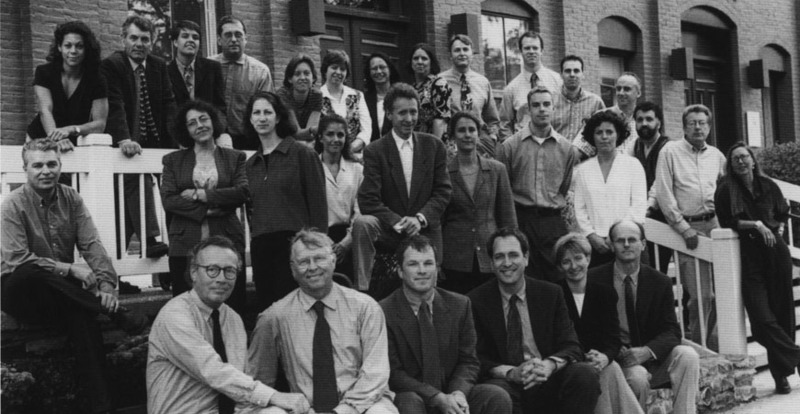 Over the course of twenty years, starting in the mid 1980s, Truex DeGroot Cullins grew to a 45-person architecture firm. 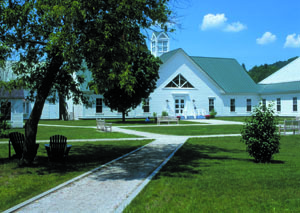 The office strengthened its relationship with area institutions of higher education and designed a series of buildings for college campuses throughout Vermont, often in concert with one another to create interconnected and intimate outdoor spaces. Two notable examples are the Cornell Library at Vermont Law School and the Miller Information Commons Library at Champlain College. Later, the firm contributed to the shaping of campuses at The University of Vermont, Champlain College, St. Michael’s College, and Vermont Law School. The firm developed the St. Michael’s College east campus master plan, and later went on to produce the design of the Hoehl Welcome Center, a building that openly greets prospective students and their families while gesturing to the college’s rich Edmundite heritage. The firm developed transformative urban design solutions for large municipalities as well, including the Winooski downtown redevelopment master plan and the East Providence Waterfront redevelopment master plan. At the same time, Truex DeGroot Cullins worked on a number of private residential projects in both urban and rural contexts. These homes were often formally organized and precisely configured, yet fit comfortably within the randomness of nature. They were a careful assemblage of parts, responding well to both site and client. 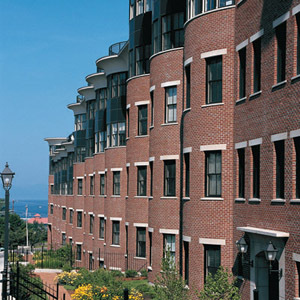 The formal residential designs of the late twentieth century coalesced with the previous 30 years of urban design projects and culminated in the development of one of Burlington’s major downtown blocks. The Residences at College and Battery, along with the nearby Westlake Residences and Marriott Courtyard Burlington Harbor Hotel, comprise a family of brick- and glass-clad structures that denote the city’s edge and complete the urban work that began 30 years earlier at Saint Paul’s Cathedral. Over the past decade, TruexCullins has continued its tradition of shaping public spaces and promoting holistic and integrated design. In 2006 the firm refined its name to better reflect the combination of exterior and interior design expertise. Today, TruexCullins Architecture and Interior Design is organized into five design studios: workplace; education; resort; residential; and interiors. The work is carried out under the leadership of David Epstein, Richard Deane, Kim Deetjen, Lee Grutchfield, and Rolf Kielman. While the firm maintains its dedication to improving communities in and around Vermont, the reach of TruexCullins has grown to extend far and wide. The education studio offers architectural design and master planning services for K-12 and higher education institutions. The work of the education studio has touched five continents, from Brazil to Russia to Madagascar. 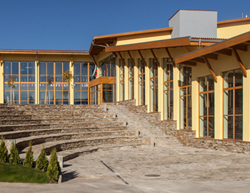 The Anglo-American School of Sofia was recently awarded LEED-Gold Certification for a major expansion of its middle and high school. With international school projects like this one, TruexCullins aims to respect each project’s unique cultural identity, while progressing the universal concepts of 21st century learning. The resort studio has built a portfolio of hotels and recreational facilities that offer peaceful refuge from day to day life. This work naturally began with ski lodges of the green mountains, and soon grew to include mountain resorts in the Adirondacks and the Rockies. 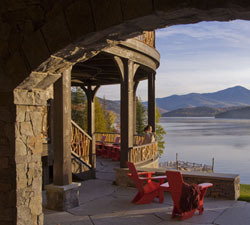 Lake Placid Lodge is a luxurious 35 guest suite inn that combines rustic elegance with the comfort of a mountain retreat, designed in the tradition of the grand Adirondack lodges of the turn of the century. The home studio develops personal solutions for clients while exploring concepts of transparency, pre-fabrication and sustainability. These now include an increasing number of net-zero homes that produce as much energy as they consume. Green design is hardly a new concept for the firm, reaching back to the Sunpower Homes of 1975 by Rolf Kielman and Terry Jacobs. 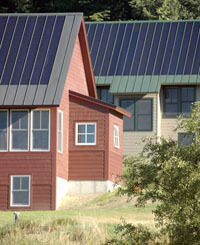 Today, advances in energy innovation are being realized in projects such as South Farm Homes, a collection of six net-zero energy houses clustered on a south-facing hillside in central Vermont. In the workplace studio, TruexCullins is pushing the envelope with high performance commercial buildings that rise to meet the challenges of the twenty-first century. 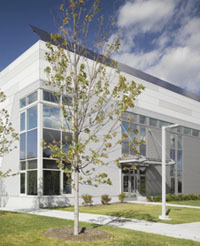 One such example is the LEED-Gold Certified aircraft hangar and public terminal for Heritage Aviation at the Burlington International Airport. A 1955-era Air National Guard hangar was stripped down to the steel and rebuilt as a model of sustainability for the aviation industry. The interior design studio has grown under the leadership of Kim Deetjen and specializes in hospitality design. The interior design team produces site-specific design solutions that are uniquely tied to their locale, including projects in Sausalito, California; Bar Harbor, Maine; and Jackson Hole, Wyoming. 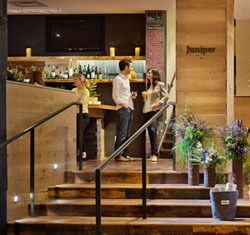 At Hotel Vermont, the locavore movement was expanded to the interior design for a uniquely branded guest experience that is specific to the property and its location. TruexCullins is fortunate to have inherited the legacy of some of Vermont’s most esteemed architects. The work of Bill Truex, Tom Cullins, Gene Alexander, Willem DeGroot and others is the foundation upon which the firm has built a path of design excellence. As TruexCullins celebrates a half century of service, the firm continues to forge design solutions to meet the challenges of today, with a steadfast belief in the power of design to transform communities and improve lives.